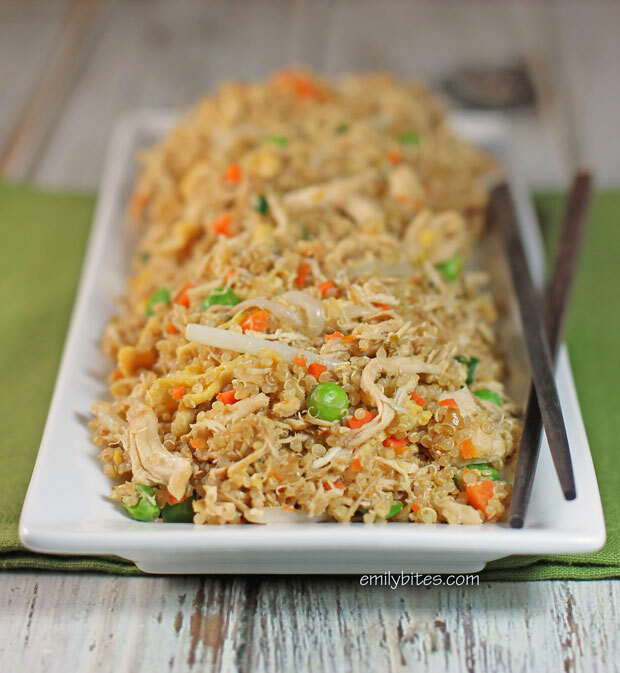 You may not find this one on your Chinese takeout menu, but this Chicken Fried Quinoa is every bit as delicious as the more traditional fried rice, and as a bonus, it’s healthier! I listed two sets of nutrition information and Weight Watchers points, because I really think you could eat this as either a main course or a side dish. If it’s your main course you could serve some tasty stir fried vegetables on the side, and if it’s your side dish, I have some tasty main course ideas for you right here. 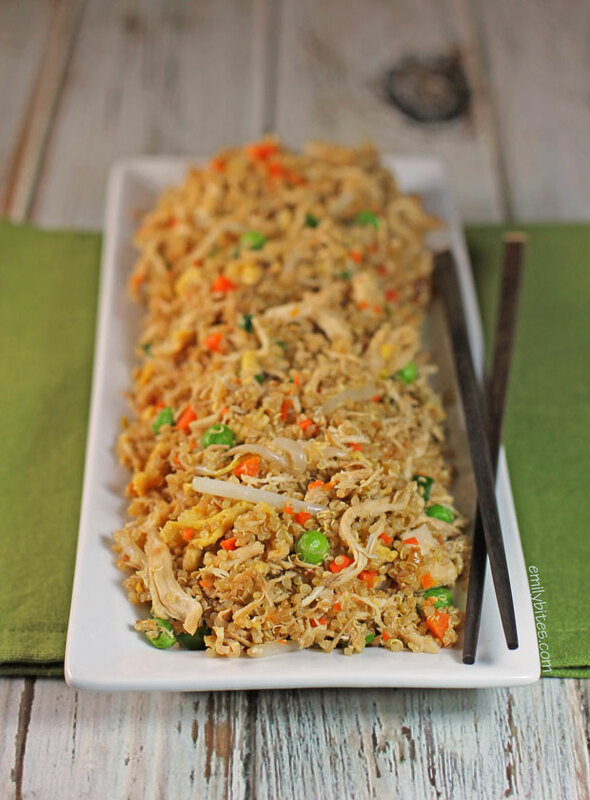 Either way, this is a super tasty and easy dish that you and your family will love. In a wok or large saute pan, bring two teaspoons of the canola oil over medium heat. Add the chopped onion and cook for 8-9 minutes, stirring regularly, until the onions are cooked through and browning. Remove the onions to a side plate and remove the wok from heat. In a medium bowl, combine the eggs with 1/8 teaspoon of the sesame oil and 1/8 teaspoon of the soy sauce. Lightly beat the eggs with a fork. Place the wok back over medium heat and add the remaining teaspoon of canola oil. Swirl the pan to coat the bottom. Add the egg mixture and scramble the eggs using a spatula. Remove the eggs to a side plate. Pour the remaining tablespoon of sesame oil into the wok and bring to medium heat. Add the cooked chicken, peas, carrots and the cooked onions from step 1 and stir until well mixed. Stir fry for about 2 minutes. Add the quinoa, scallions and bean sprouts and mix together. Continue to stir fry for another 3 minutes. Add the scrambled eggs and drizzle the entire mixture with the 3 tablespoons of soy sauce. Mix the soy sauce in to coat and stir fry for another minute. Now that is pure genius! Fist bump to you for switching out rice for quinoa. Yummy! I am adding this to my “to make” list. Another amazing quinoa recipe! I can’t wait to try this out. Thank you so much for sharing these amazing recipes. Basically everything I cook now is one of your recipes. Aw, thanks Lisa! 🙂 I hope you love it! Does the quinoa need to be cooked well ahead and chilled like rice would have to be for fried rice? I made mine the day ahead for convenience sake, but since quinoa isn’t really sticky like rice I’m not sure that it matters. I haven’t tried it just cooked, but I’m actually thinking it’d probably be okay. The Texan in me pictured something completely different when I read the recipe title, heh. That said, I can’t wait to try this! THIS IS SO GOOD! I made this tonight! To answer the question above about allowing the quinoa to “rest”: I used mine immediately after cooking it without a problem. I can’t believe how big the portion is. I had it with an eggroll and tried to eat more than the 1 1/3 cups and was too full! LOVE! This may be a silly question, but do you use canned bean sprouts? I tend to shy away from canned vegetables in general, but the grocery stores near me don’t seem to stock fresh. I guess I could sub fresh broccoli slaw for some of the veggies for a similar effect with fresh produce? Otherwise, this sounds delicious and I can’t wait to try it! I love snow peas, so I agree :). I would chop them up to keep everything small, but I’m sure they’d be delicious. I’m so glad you loved this one! Made this yesterday. Even my picky husband liked it! I loved this recipe…but why does MyFitnessPal log it as 564 calories? Not the 306 main course amount listed on your recipe? Not sure, but that’s definitely not correct. Did you use the import feature? I’ve never used that but I hear it is very hit or miss. When I put it through the WW recipe builder it supported the 306 I got from manually selecting ingredients in MFP. I did use the import feature but I think they were having update issues. Either way I loved this recipe and would definitely make it again! Thanks for your awesome recipes. They have helped me in my weight loss journey (66 lbs down and maintaining). Excellent! Made it tonight and added in water chestnuts since I did not have any sprouts! You have created wonderful recipes. Thanks so much for sharing! Made this tonight. Very good. Used bell peppers. My dad ate it all, and my little brother came back for seconds! Made this tonight but without the chicken because I used it as a side dish with your ginger sesame chicken. It was great! Definitely helpful for a Chinese food craving. I basically made all your quinoa recipes today (beef enchilada, buffalo chicken and chicken parm). I decided to just get two bags of quinoa and make them all so we have flavor variety for the week and I froze one casserole of each as well so now we have one in the fridge and one in the freezer of all of them!! We love your recipes, and used to make them all the time until I got pregnant again and we fell off the wagon on eating better. Hopefully we are back to stay this time :). Thank you for all your recipes!! This was FABULOUS! Only small change I made was to use less Sesame Oil (not a fan) and more Canola. Even my fiance who typically hates Chinese loved this one. Way to go! Can’t wait to make this one with Shrimp and Pork next. Yum! This was so good and easy! I made it at home and loved it so much that I made it the following day and took it to my mom’s to share with my siblings and their kids. Everyone who ate it loved it and couldn’t tell the difference between it and rice. I made extra quinoa and chicken the first day which made it so easy to throw together the next day. You can use matchstick carrots to cut down on prep time(cutting carrots is one thing I loathe). I also added chopped water chestnuts the 2nd time for little extra crunch. I made this for dinner this evening, and everyone loved it! This was absolutely delicious! Honestly tastes the same as if you were using rice. Definitely gonna be a weekly protein filled meal! Thank you! Made this last night. My husband is trying to do all “good” carbs these days, and he said it felt too decadent for him to be eating – we loved it. Made it exactly as written, was super fast to throw together as we had leftover chicken and I make the quinoa in the Instant Pot as I started the recipe. Can this be refrigerated and eaten a day or two later or is it best eaten the day it’s cooked?